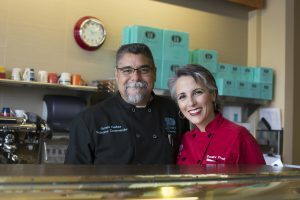 Denica’s is owned and operated by husband and wife team James and Denica Freitas. Their vision is to provide a place where friends, family and enthusiastic food lovers come together to eat delicious homemade cookies and savory food in a warm, casual atmosphere. It is their goal to make you feel welcome and nourished every time you come to Denica’s.